San Jose, CA February 21,2012 — When bidding on a large commercial solar water heating project such as an apartment building, hotel, or hospital, installers need accurate hot water usage data in order to design the most optimal solar thermal system for the customer. Now solar installers can more precisely measure a building’s current hot water usage with Free Hot Water’s new V15 Ultrasonic Flow Meter. Solar installers and their solar thermal design engineers typically estimate a building’s current hot water usage based on several factors. These factors may include the number of residents in an apartment building, and the number and type of washing machines. This data is then incorporated into an algorithm that approximates the building’s monthly hot water gas usage, but is only a rough guestimate based on the number of wash loads per person, the number of showers per person, etc. 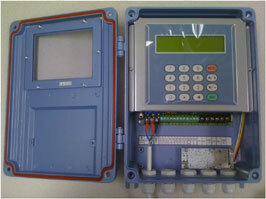 The V15 Ultrasonic Flow Meter eliminates the need for guessing. Instead, the V15 tool provides solar system designers with a building’s actual hot water usage through flow sensors that clamp onto the outside of the cold water pipe and measures the flow into the existing hot water storage tank. After a week or two of recording flow data, solar installers will have an accurate picture of the building’s weekly hot water usage and can design the most optimal solar thermal system that for the needs of the building. The V15 technology is based on transit-time flow measurement principle, which measures the flow rate of a liquid in a closed pipe through a pair of clamp-on or wetted ultrasonic transducers. In addition to solar hot water applications, plumbing professionals and commercial contractors can use the V15 for a wide range of industrial pipe flow measurements. Oil (crude oil, lubricating oil, diesel oil, fuel oil, etc. An SD memory card inside the V15 automatically records the data, which can be later exported to a computer via a USB output tool. 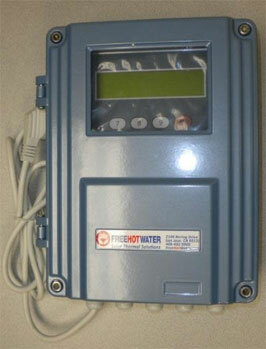 Visit shopfreehotwater.com for more V15 flowmeter specifications and to download a Free Hot Water quick start guide. Free Hot Water, based in San Jose, California, offers affordable, high quality hot water systems for commercial and residential applications. Our products and systems are clearly distinguished by their integrated design, quality, affordability, and ease of installation. We feature our own SRCC 0G-100 certified collectors and exclusive mounting and racking systems, providing high quality, reasonably priced, solar thermal solutions for your business or home. We’re also a distributor of a wide selection of superior quality SRCC OG-300 systems. Our San Jose in-house engineering department specializes in designing solar thermal systems for a variety of large scale commercial applications. We evaluate each project, and design custom systems that are optimized for the unique needs of your business. Free Hot Water’s extra-mile customer service also includes submitting all documents necessary for permits and help to get you all applicable financial solar incentives.